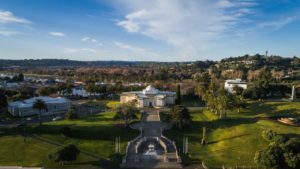 One of New Zealand’s most important heritage buildings and art collections will celebrate its hundredth birthday on September 6 next year. The iconic Sarjeant Gallery first opened to the public on that date in 1919 and will mark the milestone throughout 2019. “It is an honour and a privilege to be director at the Sarjeant at such a pivotal time in the Gallery’s life,” says Greg Anderson. “We intend to celebrate not just the anniversary of the Sarjeant Gallery at Pukenamu Queen’s Park and those who built it one hundred years ago; but also acknowledge Henry Sarjeant’s original bequest which made it all possible.” In his Will he stated that a gallery be built for Whanganui ‘as a means of inspiration for ourselves and those who come after us’. “Sarjeant’s bequest was an amazing gift.” In addition, the Sarjeant was gifted its Maori name, Te Whare o Rehua Whanganui or House of Inspiration by Whanganui iwi in 1995. Planning is already underway for the centenary celebrations with an event to be held at the River Traders’ Market, a family day and other events at the Sarjeant and of course a birthday party. The Friends of the Sarjeant have commissioned Martinborough glass artists Jim Dennison and Leanne Williams of the Crystal Chain Gang, to make a unique chandelier constructed using hundreds of press-moulded glass droplets. The drops will be cast from the unique architectural details in the Sarjeant Gallery, which was designed by the young architect Donald Hosie. The chandelier will be gifted to the Sarjeant on its 100th birthday and unveiled next year as part of an exhibition. The ever popular Whanganui Arts Review will also get a boost in the Sarjeant’s centenary year. Thanks to the new principle sponsor pattillo the Arts Review Open Award, has more than doubled to $5000 and joining longstanding Arts Review sponsors Central City Pharmacy, is Dalgleish Architects who will sponsor a second Excellence Award to the tune of $1000. The increase in prize money for artists is an exciting development for the Review. The Sarjeant shares its centenary with the Durie Hill Elevator and there is a fun plan afoot to sing the two buildings into their hundredth year together. “We would love to hear from any choirs who would like to help us celebrate late next year. The Durie Hill Elevator and the Sarjeant have seen each other through a lot from either side of the river and we’d love to celebrate them both with a powerful singalong from each site late next year” says Relationship Officer Jaki Arthur. “So much has changed in 100 years. When the Sarjeant first opened to the public it was purely a place for looking at art on the wall – or sculpture on the floor,” says Anderson. “Nowadays, galleries serve the community in many ways and are used as a resource by art lovers, scholars and artists, families, school children, tertiary students, older people and people from all walks of life who just want to come inside and have a chat, and be challenged, charmed or calmed by looking at artwork.